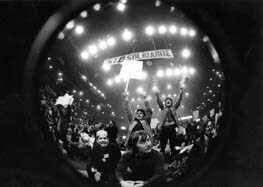 Since the late 1960s, the Quebec labour movement has been characterized by the establishment of common fronts, the most well known being the first joint public sector common front, which, in 1972, united more than 210,000 provincial government employees from a combination of unions. Once united, the common front called for - and won - a minimum wage of $100 per week, cost-of-living adjustments, improved pension plans and significant wage increases for all. 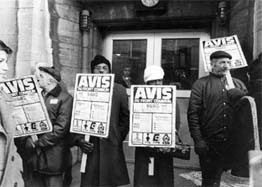 Negotiations were marked by the most extensive strikes in Canadian labour history, the imprisonment of three union presidents and more than a dozen militants, and, above all, considerable disruption for the public in the form of roadblocks and the occupation of towns, airports and radio stations. The government was forced to ask union presidents to appeal for prison release in order to continue the bargaining process. Some months later, in October, the workers' principal demands were met. [Translation]"This exceptional act of repression [the imprisonment of three union presidents] unleashed the first general solidarity strike - spontaneously launched by the anger of workers - in the history of the labour movement in Quebec. Scarcely had the three presidents been imprisoned in the Orsainville prison on May 9, when unions everywhere mobilized in a dramatic reaction to the established order and its "legality." All told, more than 300,000 union members participated, for varying periods of time, in this major week-long uprising, which called for the release of the imprisoned leaders. The events of May 1972 gave an incredible boost to class solidarity. Work stoppages broke out in the public and private sectors alike: among construction and metal workers, miners, machinists, auto and textile workers, stevedores, salespeople, print-shop employees, the staff of major news media, teachers and some hospital workers. In towns like Sept-Îles, Thetford, Sorel and Joliette, the strike was almost generalized, with people talking about the strikers "occupying" and "being in control of" workplaces. Radio and television stations were occupied by the union members, who broadcast their messages." Excerpt from Histoire du mouvement ouvrier au Québec (CSN and CEQ), 1984, p. 266. [Translation] "It was not necessary to create a common front in an effort to obtain the goals we could have reached through ordinary negotiations. Our demands were aimed at helping the most disenfranchised of society. When our demand of $100 per week for the lowest classification was made public, several of our members objected because it was unthinkable, unachievable and unacceptable. But, in a year and a half, no-one will earn less than $100." Quote from Marcel Pepin, President, CSN, in Minutes of the conference: Fedération nationale des services, 1972, p. 1.